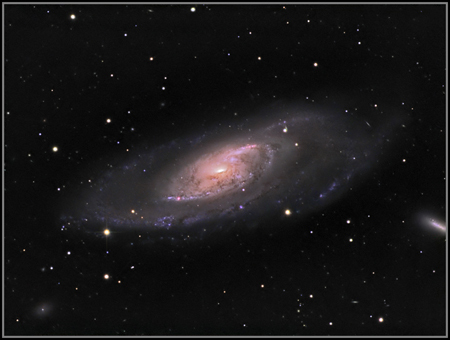 M106, in Canes Venatici, is generally classed as an Sb type spiral and as such is similar to M31, as is easily seen here. There's a fairly moderate black hole at the centre with a mass of 39 million solar masses, which consumes about 1% of a solar mass per year. I first imaged this with a borrowed OSC camera in April, and took over 40x 6 minute subs, but wasn't happy with the result, so I started again with a mono camera and filters. There's a little Ha added to the red, but only at about 20% opacity, as I wanted to avoid the separate 'jewels' of deep red that I've had with my previous additions of Ha in various images. Imaged over several nights in May 2009 with my TMB 152 and Atik 16HR. Red. 1 hr 24 minutes binned 2x2. Green. 1 hr 48 minutes binned 2x2. Blue. 2 hrs 17 minutes binned 2x2. Ha. 1 hr. binned 2x2. Total imaging time was 15hrs 20 minutes.